Tim created a fantastic tag for March for his monthly "12 tag series". He used a technique I had never tired before so I set out to not only test the technique, but to test Ranger's new Texture Pastes that were released at CHA this year. Follow along and I will show you the results. I started by coloring a few pieces of manila cardstock with Cracked Pistachio, Picked Raspberry and Mustard Seed Distress Ink. 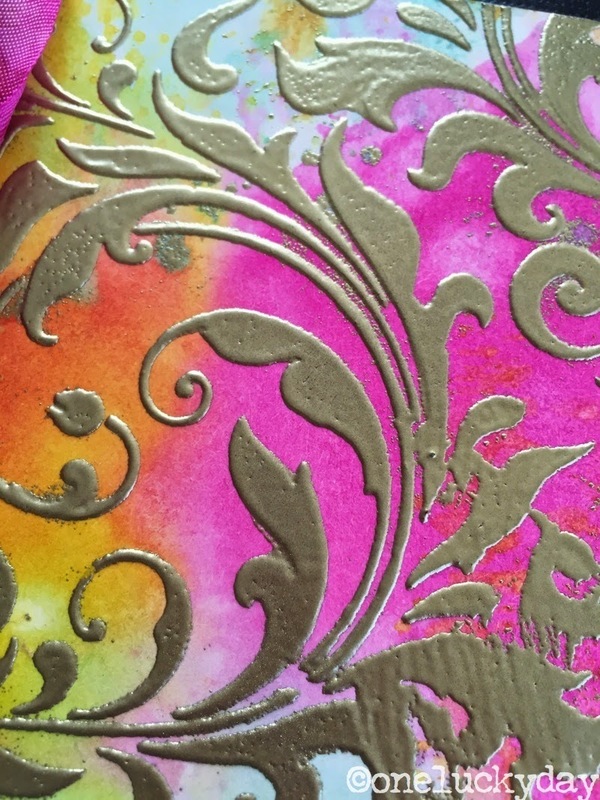 The Picked Raspberry and Mustard Seed Distress Ink can be over powering so take that into account when mixing colors. Next, I used the Flourish Layering Stencil to add Texture Paste (this is the new Transparent Gloss finish) over the stencil. The new gloss (and matte for that matter) paste is creamy compared to the regular Texture Paste. It is easy to drag across the stencil and get a smooth finish. Peel back the stencil and wash immediately to remove Texture Paste. Remember it's transparent so at this stage you could let it dry for a beautiful shiny flourish over the ink. But to test Tim's technique I will need to pour Fine Detail Gold Embossing Powder over the WET Texture Paste and let it dry...meaning the Texture Paste needs to be DRY before you heat the Embossing Powder. Once the texture paste is dry, heat emboss the powder to get this fabulous color - like liquid gold. I mounted the flourish paper onto black Core'dinations cardstock. Next I needed to cover the bottom where the stencil did not reach, so I grabbed a gold Deco sheet. These are sheets of sparkly self-adhesive paper. Easy to cut by hand or with a Sizzix die. I mounted the cut Deco strip onto cardstock to give it a little more stability. 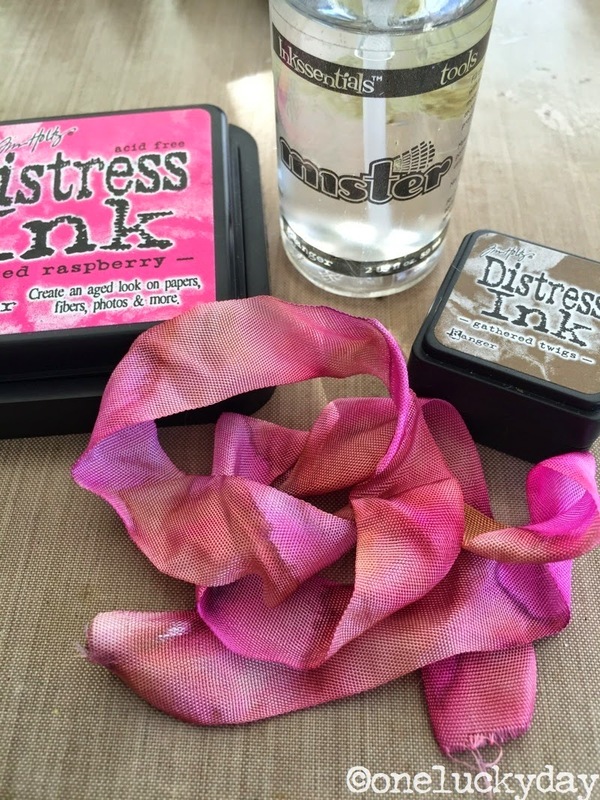 I also colored a piece of Crinkle Ribbon using Picked Raspberry Distress Ink. Once dry, I added Gathered Twigs to a craft sheet, spritzed it with water and pounced the dry ribbon into it. Adding the Gathered Twigs to the dry ribbon helps you control how much brown you want to add, creating this great vintage look. 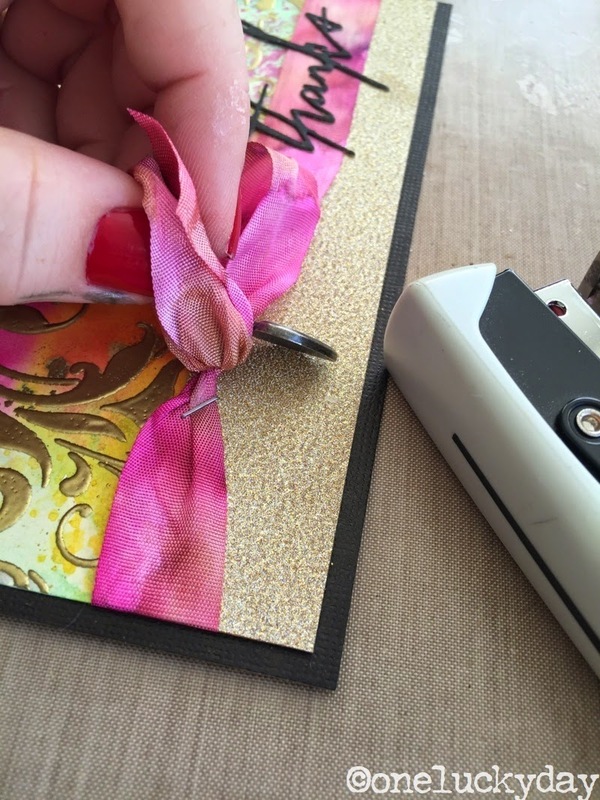 Add the Deco strip and Crinkle Ribbon to the card front, tying a simple bow. Cut a word from the Thinlits "Celebrations" set. I cut mine using a tag so I could use the tag "leftover" later. I painted the word with black Distress Paint to fit with the card front. Add the word to the card front with Multi Medium. An easy way to do this is to pounce a bit of Multi Medium on to the craft sheet, then place the word into the the glue. It will coat the back of the tiny word and make it easy to add to the card. I wanted to add a Heart Charm to the bow but the metal is heavy, so I lifted the bow and added a staple using the Tiny Attacher underneath. Love how it turned out. The colors are bright, yet subtle. 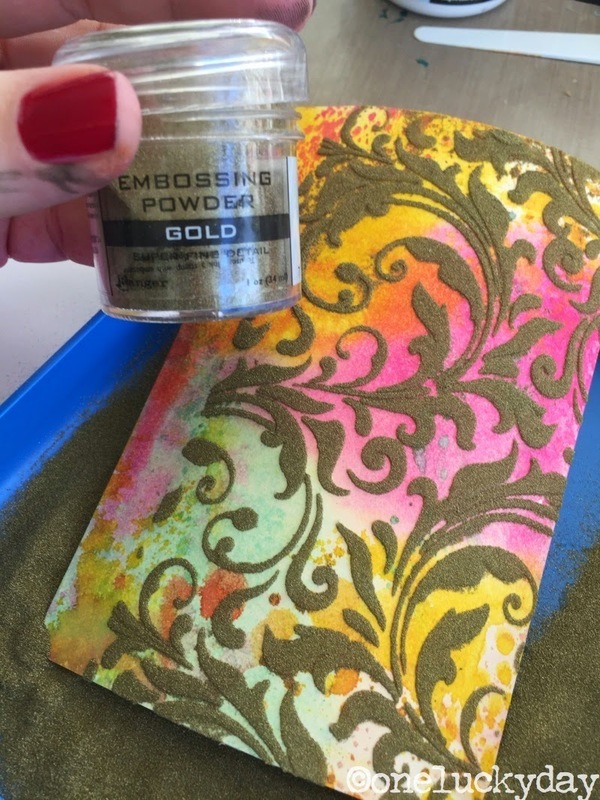 The embossing powder looks amazing - really, really gold. So here is the testing part! 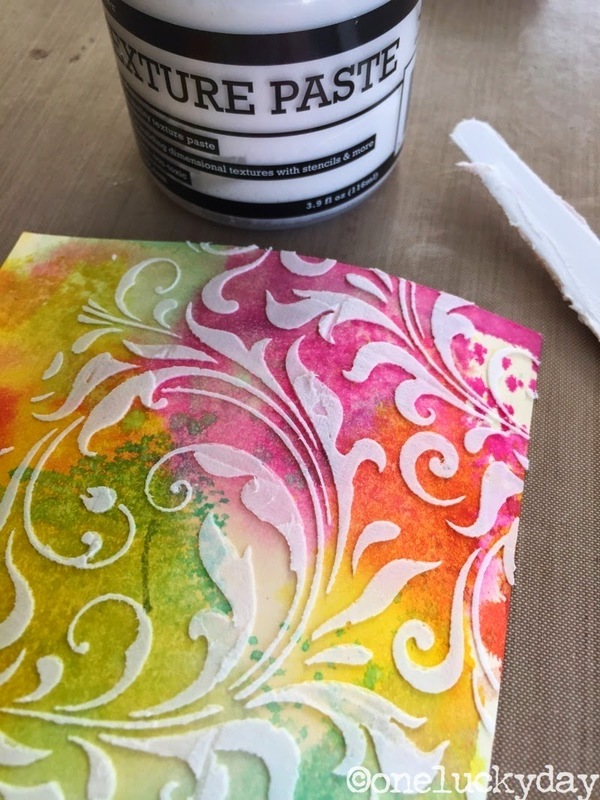 I created three separate Distress Ink cards with the three different Texture Pastes - Texture Paste, Texture Paste Transparent Matte and Texture Paste Transparent Gloss. I used the same Ranger Embossing Powder on each sample. Texture Paste - the paste is thick and gives you the crispest image. It dries very quickly so you need to work fast. I recommend having a tray of water to ready to toss the stencil into so you can be adding the Embossing Powder right away instead of cleaning. This paste dries the quickest of the three tested. It also gives a grittier texture, which is great for some applications. Texture Paste Transparent Matte - A smoother finish that the straight paste. Takes a little longer to dry but a great result. Goes on smooth and easy. Texture Paste Transparent Gloss - the gloss is the smoothest of the three pastes. You can see that the texture is more like melted butter than the crisp finish of the first texture paste. So it really is a decision of what kind of finish are you looking for, crisp or smooth? you make the call! 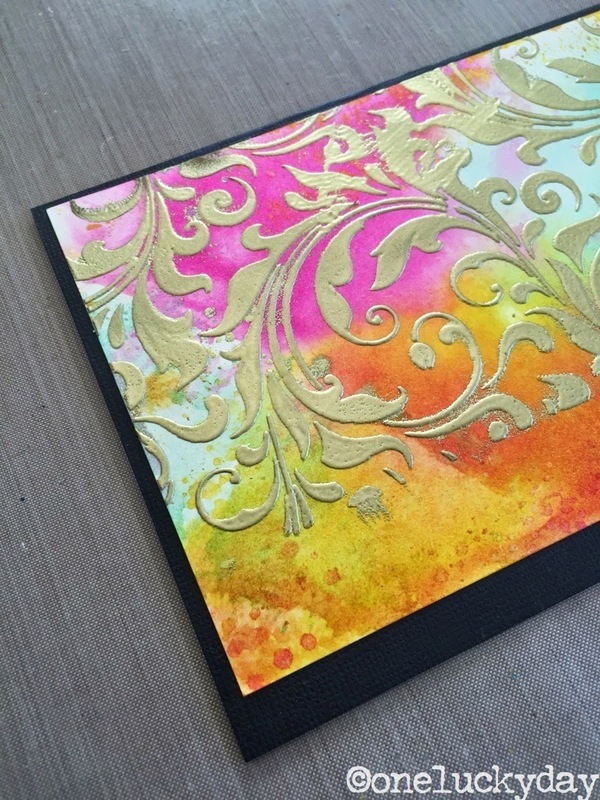 The Texture Paste Transparent Gloss was the perfect paste to use for this particular card. I sure hope to do more testing of the two new products to see what they can do without the Embossing Powder! Since it's St. Patrick's day today I thought we would end by giving away a little green! Cracked Pistachio that is! Please leave a comment and I will pick a winner on Thursday the 19th. I told you that "leftover" tag would come in handy! Hope you liked today's project! Thanks to Tim for demoing the great embossing powder technique. Be sure to go to Tim's blog to see his tag. It really is fantastic! And if you make a tag using this technique, be sure to add it to Tim's March "12 Tags" post to win a prize. WOW, what a beutiful tag and thank you for the totorial and showing the differents between the different paste! Thanks for the comparison ! The paste is on my worktable ... waiting to be sampled. Thanks for the push, lol. And I love the idea of cutting your word out of a tag - double up ! 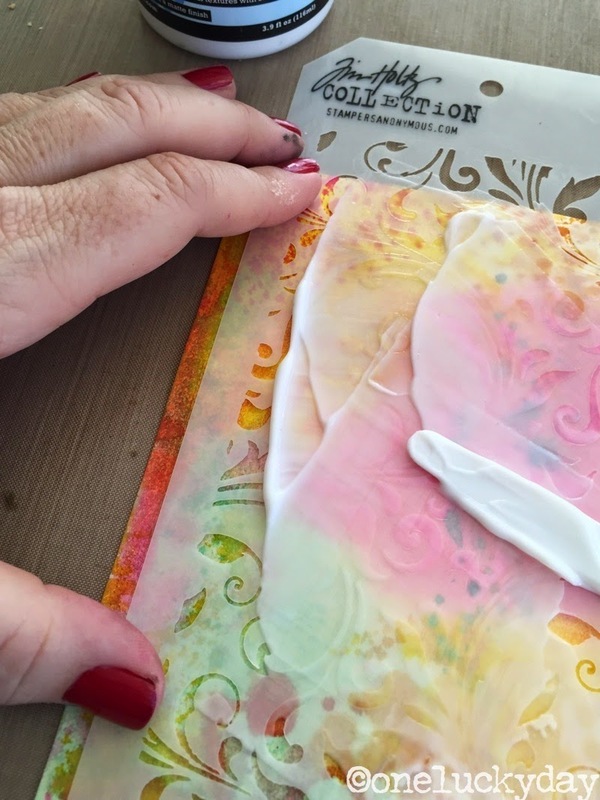 gorgeous creations makes me feel like crafting and getting all messy with my inks, and will have to check the Internet out now for the paste, I think my favourite is the glossy one will have to go back and look again, fantastic. Another beautiful creation, Paula. Always so easy to follow your instructions. Looking forward to playing. And the Cracked Pistachio is so pretty! Awesomely Beautiful! 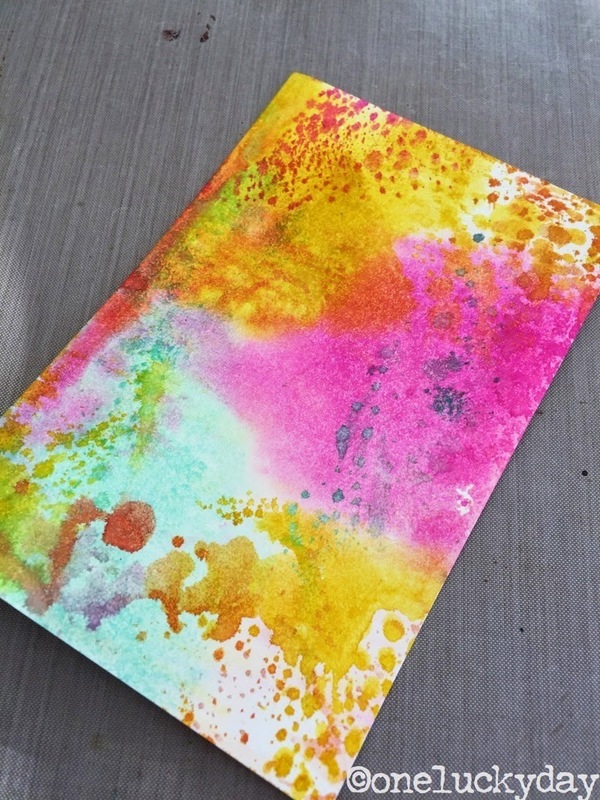 This would be a great addition to my mix media layouts! Thank you very much for sharing this beautiful creation and for the comparison! Love the warm final texture and the new January colour!! Oh my goodness - stunning project and I love the pistachio shade - gorgeous! Your step by step instructions are brilliant! Paula, Thanks so very much for this tutorial! I'd wondered since seeing Tim demo the texture paste about the difference in the 3. Hooray, now I know! Absolutely LOVE this tag! Thanks for the demo and explaining the differences in the texture pastes and the chance to win!!~! Iced Spruce called me this morning. She is very jealous. She thinks she has been replaced in your heart by another. She thinks you love Cracked Pistachio more than her. I think you need to show her some love, Paula! I can't have these colors calling me, crying on my shoulder. I LOVE your tag. It is so elegant. Not a bunch of stuff going on. Just simple and beautiful. If you pick my name, please pick someone else as I already own the Cracked Pistachio family! I forgot! I was so upset about poor Miss Iced Spruce! Appreciate you testing out all the new Texture Pastes and letting us know the differences in them. Thanks for being the guinea pig! Wow! I sure learned a lot from this tutorial, Paula. Thanks for explaining the difference between the pastes so well! Wow I'm in love with your card!! Beautiful effects ~ thanks for sharing the tips... green is my favorite color, so the set would be perfect! 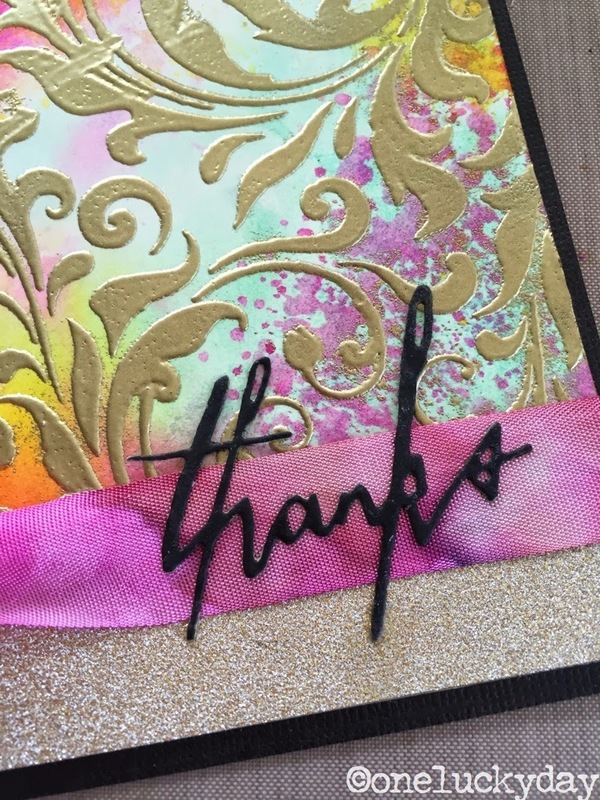 I LOVE your card and want to thank you for going to the trouble of explaining the differences between the texture pastes. I have just finished Tim's tag for this month and it never crossed my mind to try his other pastes on this technique. A truly inspirational post with a great tutorial, along with the perfect treat at the end... cracked pistachio goodies and a gorgeous tag giveaway. Theis embossing technique is soooo cool! Thanks for the run through with the different pastes. The finished card is stunning. Love the sparkle from the deco sheet and the pop of pink. Fun giveaway. I could use a little cracked pistachio in my life. Testing 1, 2, 3. TFS Paula! Beautiful card Paula! I agree, the straight texture paste dries VERY quickly, I tried my hand at Tim's tag, and have to try again because it dried so quickly! Thanks for the beautiful inspiration! very helpful and a stunning card, too. Thanks so much for this great tutorial Paula, so interesting to see the differences between the three texture pastes. Love the effect with the transparent paste, gorgeous! And thanks so much for your very generous giveaway and Happy St. Patrick's Day to you and yours! I'm just venturing into the world of mixed media and really appreciated your tutorial - I'm certainly going to get all 3 texture pastes to play with now! Thanks! Oh my gosh! I love today's project, Paula! I can't wait to try the different pastes. I love the gold embossing, too. Thanks so much for a chance to win your wonderful prize and tag! 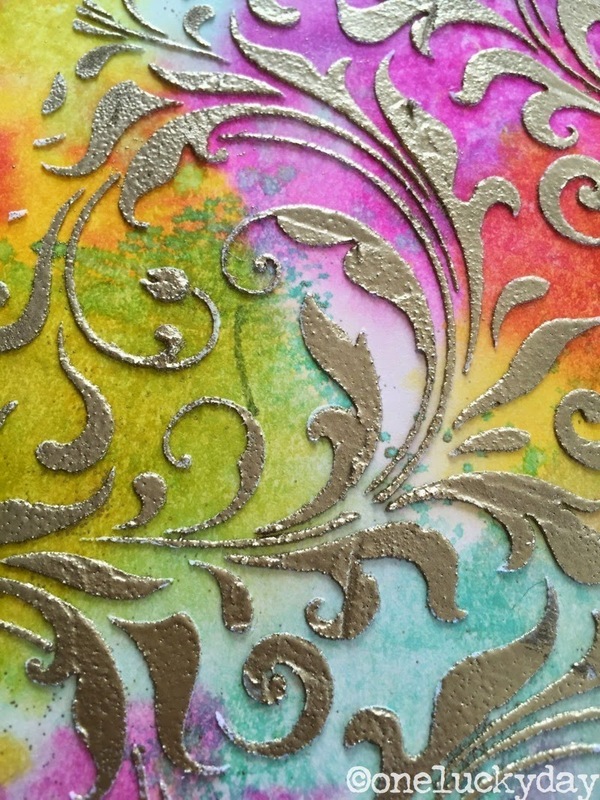 It has been a long time since I have used my embossing powders. I love the idea of using them with texture paste. A great look! Thanks for a wonderful tutorial, will be dusting off the powder lids. Haven't gotten to do any of Tim's tags yet this year, but this technique is one I HAVE to try regardless. Thanks Paula, for your comparisons! And thank you for a chance to have that gorgeous Cracked Pistachio set!!! I love how your card came out. I didn't let my texture paste dry before I heated it and it gave it an awesome grungy look. Thanks for showing how the different pastes look using the same technique! What a cool card! I just used Picked Raspberry today, and I noticed how vibrant it was (more than I wanted). Thanks for your experimenting, Paula! Those close-up shots are amazing and you can really see the differences with each new Ranger paste! Very cool! Who knew?! Thanks for this post. I have not used texture paste and the variety was confusing before your excellent photos and technique. Thanks again! Thanks for ending my texture paste confusion!! I love how your card turned out!! This is a beautiful card. I love when you do comparisons of different products. It helps me to know what I want and how to use it. Thanks. wow.... this is absolutely GORGEOUS! Love the gold over those beautiful colors! 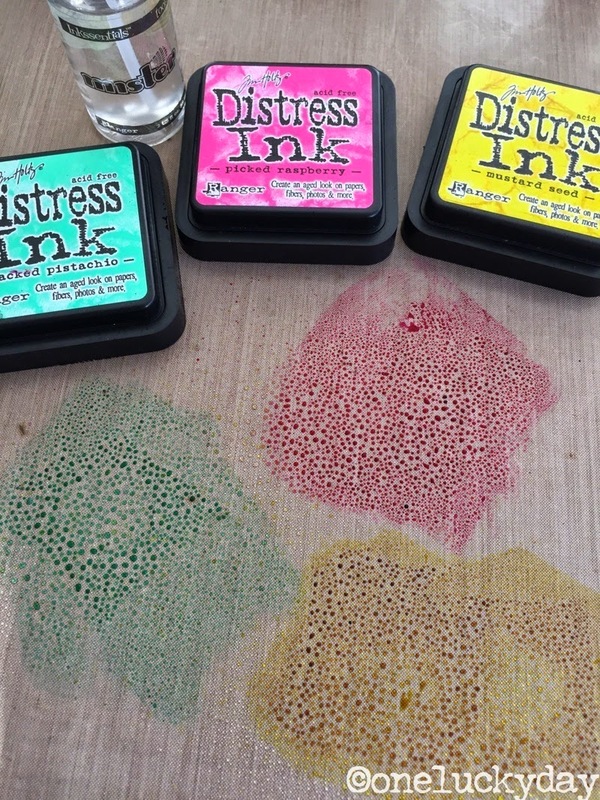 And, I went on a hunt today for the elusive and so very popular Cracked Pistachio Distress ink pad today to no avail, so I would be thrilled to win your fab prize!!! Anxious to try out the Texture Pastes too... thanks for your samples! The Transparent Gloss Paste leaves a nice finish. And, of course all the wonderful colors don't hurt! Great post, will try this for sure. And love that cracked pistachio! Thanks for the chance. Cracked Pistachio .... thanks for a chance to win. like your experiment. thanks as always for sharing. Loved it thanks Paula. I am definitely trying this today and teaching it on Saturday!!!! Thank you for showing the different results that can be achieved with the different pastes. Your card is fabulous! I tried the technique but missed the part about letting the texture paste dry before heat embossing. Will have to try it again. I don't have any of the cracked pistachio products yet, so would love to win them. Thanks for sharing! Wow, this is stunning. 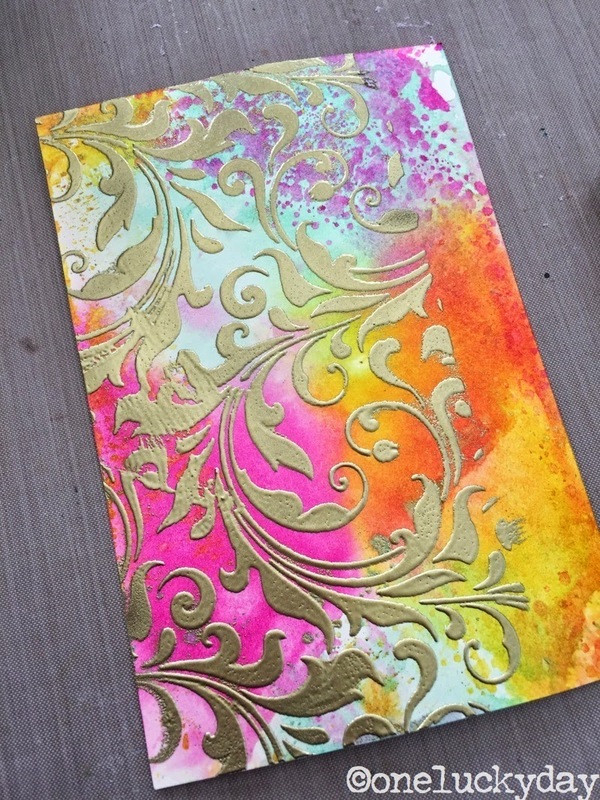 I love the colours you used and the gold embossing is so effective. Thanks for your explanation of the differences between the pastes, I now know which one to buy. Love your stunning gold embossing too. Thanks for sharing the comparisons...great photography. 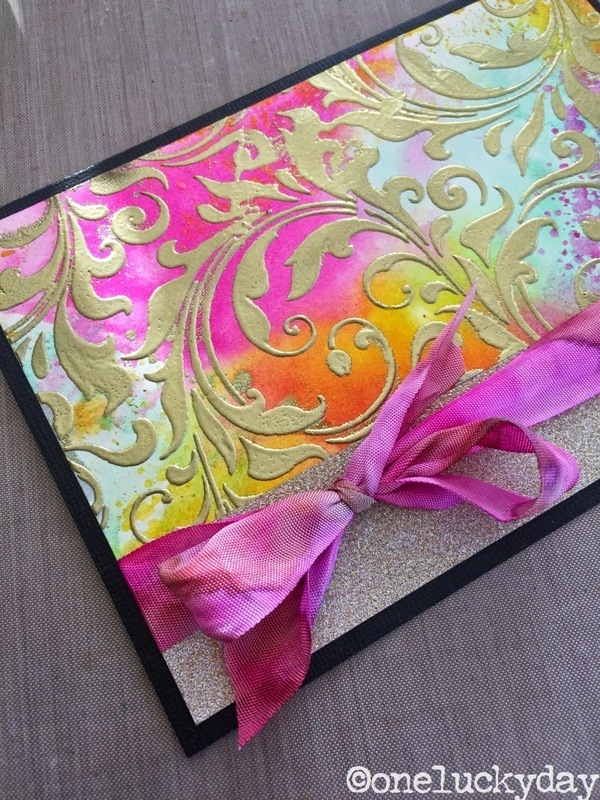 Beautiful card and thanks for showing us the difference between the pastes! Thanks for the test run, love the tag. Got a chuckle out of Sue's post! Poor iced spruce and mushroom, can't forget mushroom. Oh no Sue will be getting more calls. Thanks again for the inspiration will have to give this a try! Now I need to get some of that transparent texture paste! Love the way it looks on the card sans embossing powder. And the tag; I always add to a tag, never remove! Love the open name. I'll have to give that a try! Thanks for sharing....and enabling! I gotta have all 3 now! Thanks for sharing the texture paste demo! Lots of info and great card and tag. Love the 3 different results with these pastes. I don't have any of the new colors. Would love to win. And that tag is so cute! Love this technique! I can hardly wait to go play with it myself! Thanks for sharing and especially for showing the different pastes and what they look like. I like the matte the best - seems like a good compromise of all three. LOVE your "left-over" tag! Thanks for offering the prize, it's a good one! Beautiful card! Brilliant colors and great texture! I really like your work! I have been away for a while and really enjoyed your post on the texture medium and the resulting card. Great blog; thanks! 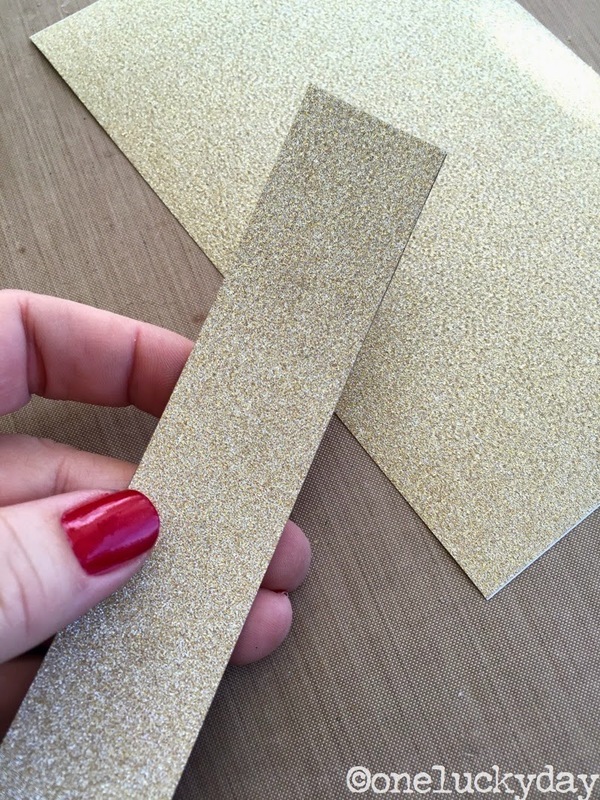 Love the look of the gold embossed on the texture paste - a great way to pop it up!!! Thanks, Paula! Fabulous! Can't wait to try it. Thanks for all the great projects. Fun to see all the effects of the texture paste - thanks for sharing. Love the scroll stencil....the big stamp is one of my all time favs. Thanks for the give-away chance. Very nice card. Thanks for the tips on the different texture pastes. Looks like a fun technique to try. And, thanks for the chance to win the pretty pistachio inks. Thanks for the tutorial. I haven't used texture paste yet, but am looking forward to all the fun I can have with it. This is just gorgeous Paula! Thanks for the texture paste tutorial too, very helpful. 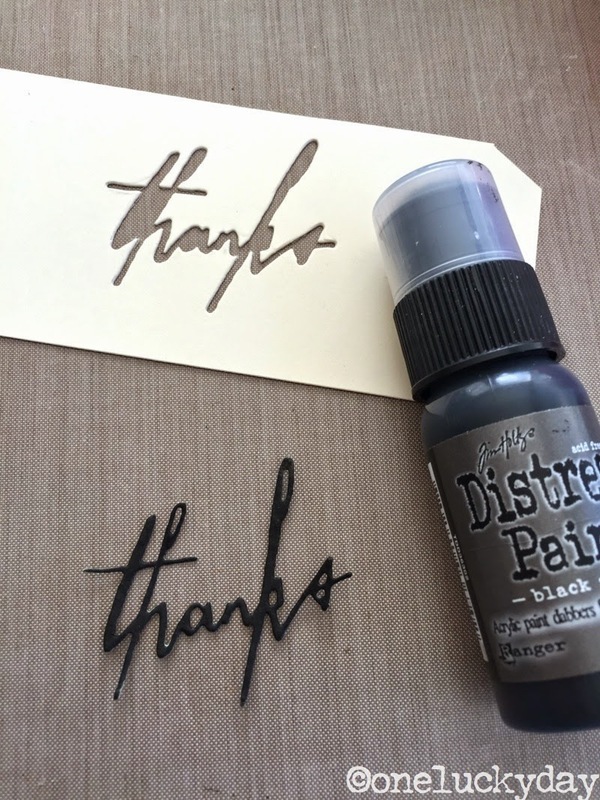 Thank you for testing all the texture pastes (so i don't have to ;-)) and writing this review. Love the tutorial and my fingers are crossed! Thank you much! I really appreciated this product comparison. It helped me decide which new product to try first. Thank you, Paula!! 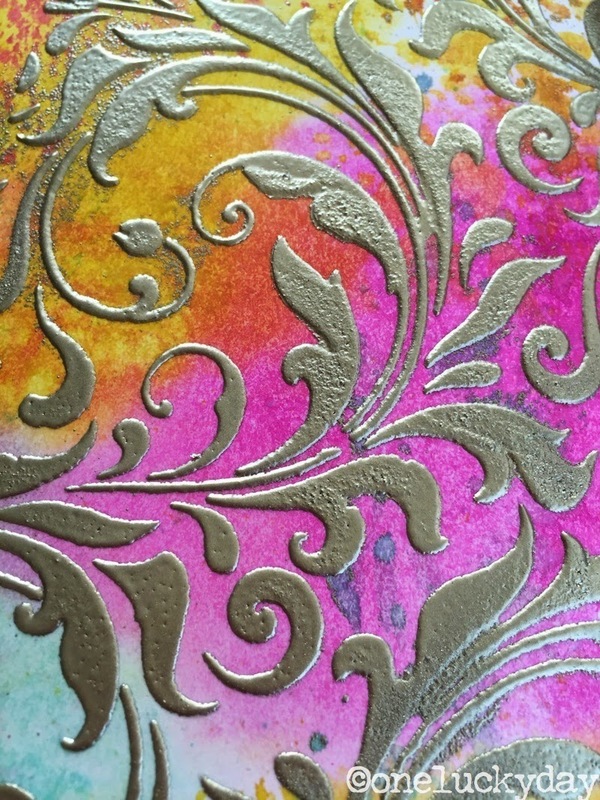 Love your flourishes on the inked background, as a card, and thanks for showing that the different pastes will have different results with the embossing technique! I love the comparisons you did. It really helped me decide which paste to try first (the transparent gloss). Cool card! Your card is beautiful! I actually prefer the gritty result of the original texture paste. Great tutorial,thank you for all the great info! Paula when I need help with a technique there you are! But I desperate now. 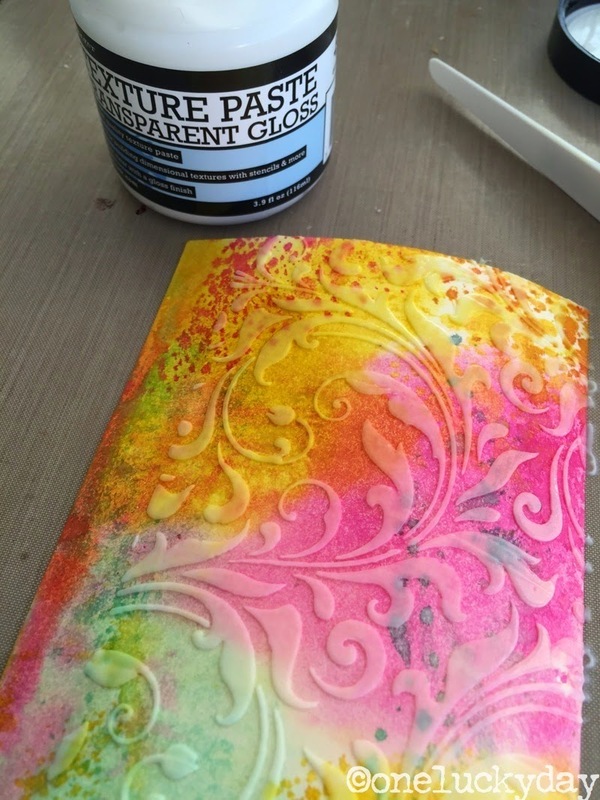 How long does it take that paste to dry without embossing? TIA. I love this! Can't wait to try it!! Wow - what a neat card, love all the details. Can’t wait to try it out, thanks for sharing. Haha! Your use of the second tag at the end made me laugh out loud! Beautiful result on both and, great tutorial! Thank you!! Love the detailed info and tips. That is my most favorite Tim-stencil by far, always gorgeous. Thanks to you!